I’ve been advocating for good tax reform for more than two decades, specifically agitating for a simple and fair flat tax. I get excited when politicians make bold proposals, such as many of the plans GOP presidential candidates proposed over the past year or so. But sometimes I wind up feeling deflated when there’s a lot of discussion about tax reform and the final result is a milquetoast plan that simply rearranges the deck chairs on the Titanic. For instance, back in 2014, the then-Chairman of the House Ways and Means Committee unveiled a proposal that – at best – was underwhelming. Shifts in the right direction in some parts of the plan were largely offset by shifts in the wrong direction in other parts of the plan. What really doomed the plan was a political decision that the tax code had to raise just as much money (on a static basis) as the current system and that there couldn’t be any reduction in the amount of class warfare embedded in the current system (i.e., the “distribution” of the tax burden couldn’t change). Well, we have some good news. Led by the new Chairman of the Ways and Means Committee, Kevin Brady, House Republicans have unveiled a new plan that it far, far better. Instead of being hemmed in by self-imposed constraints of static revenue and distributional neutrality, their two guidelines were dynamic revenue neutrality and no tax increase for any income group. With those far more sensible constraints, they were able to put together a plan that was almost entirely positive. Let’s look at the key features, keeping in mind these theoretical principles that should guide tax reform. The lowest possible tax rate – High tax rates on work and entrepreneurship make no sense if the goal is faster growth and more competitiveness. No double taxation – It is foolish to penalize capital formation (and thereby wages) by imposing extra layers of tax on income that is saved and invested. No loopholes or special preferences – The tax code shouldn’t be riddled with corrupt deductions, exemptions, exclusions, credits, and other goodies. Here are the features that send a tingle up my leg (apologies to Chris Matthews). No value-added tax – One worrisome development is that Senators Rand Paul and Ted Cruz included value-added taxes in their otherwise good tax plans. This was a horrible mistake. A value-added tax may be fine in theory, but giving politicians another source of revenue without permanently abolishing the income tax would be a tragic mistake. So when I heard that House Republicans were putting together a tax plan, I understandably was worried about the possibility of a similar mistake. I can now put my mind at rest. There’s no VAT in the plan. Death tax repeal – Perhaps the most pure (and therefore destructive) form of double taxation is the death tax, which also is immoral since it imposes another layer of tax simply because someone dies. This egregious tax is fully repealed. No state and local tax deduction – If it’s wrong to subsidize particular activities with special tax breaks, it’s criminally insane to use the tax code to encourage higher tax rates in states such as New York and California. So it’s excellent news that House GOPers are getting rid of the deduction for state and local taxes. No tax bias against new investment – Another very foolish provision of the tax code is depreciation, which forces companies to pretend some of their current investment costs take place in the future. This misguided approach is replaced with expensing, which allows companies to deduct investments when they occur. Here are the features that give me a warm and fuzzy feeling. 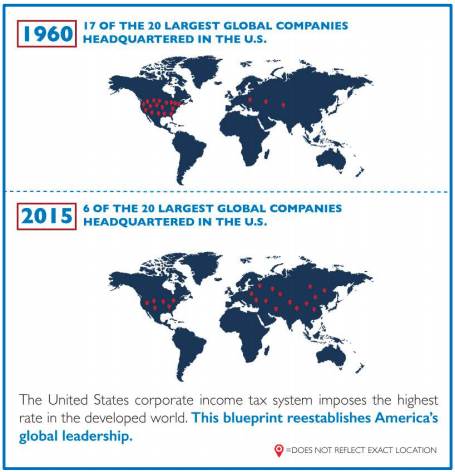 A 20 percent corporate tax rate – America’s corporate tax system arguably is the worst in the developed world, with a very high rate and onerous rules that make it difficult to compete in world markets. A 20 percent rate is a significant step in the right direction. A 25 percent small business tax rate – Most businesses are not traditional corporations. Instead, they file using the individual portion of the tax code (using forms such as “Schedule C”). Lowering the tax rate on business income to 25 percent will help these Subchapter-S corporations, partnerships, and sole proprietorships. Territorial taxation – For a wide range of reasons, including sovereignty, simplicity, and competitiveness, nations should only tax economic activity within their borders. The House GOP plan does that for business income, but apparently does not extend that proper treatment to individual capital income or individual labor income. By shifting to this more sensibly designed system of business taxation, the Republican plan will eliminate any incentive for corporate inversions and make America a much more attractive place for multinational firms. Here are the features that I like but don’t go far enough. Slight reduction in top tax rate on work and entrepreneurship – The top tax rate is reduced to 33 percent. That’s better than the current top rate of 39.6 percent, but still significantly higher than the 28 percent top rate when Reagan left office. Less double taxation of savings – The plan provides a 50-percent exclusion for individual capital income, which basically means that there’s double taxation of interest, dividends, and capital gains, but at only half the normal rate of tax. There’s also some expansion of tax-neutral savings accounts, which would allow some saving and investment fully protected from double taxation. Simplification – House GOPers assert that all their proposed reforms, if enacted, would create a much simpler tax system. It wouldn’t result in a pure Hall-Rabushka-style flat tax, with a 10-line postcard for a tax return, but it would be very close. Here’s their tax return with 14 lines. In an ideal world, there should be no double taxation of income that is saved and invested, so line 2 could disappear (in Hall-Rabushka flat tax, investment income/capital income is taxed once and only once at the business level). All savings receives back-ended IRA (Roth IRA) treatment in a pure flat tax, so there’s no need for line 3. There is a family-based allowance in a flat tax, which is akin to lines 4 and 9, but there are no deductions, so line 5 and line 6 could disappear. Likewise, there would be no redistribution laundered through the tax code, so line 10 would vanish. As would line 11 since there are no special preferences for higher education. But I don’t want to make the perfect the enemy of the good. The postcard shown above may have four more lines than I would like, but it’s obviously far better than the current system. Increase in the double taxation of interest – Under current law, companies can deduct the interest they pay and recipients of interest income must pay tax on those funds. This actually is correct treatment, particularly when compared to dividends, which are not deductible to companies (meaning they pay tax on those funds) while also being taxable for recipients. The House GOP plan gets rid of the deduction for interest paid. Combined with the 50 percent exclusion for individual capital income, that basically means the income is getting taxed 1-1/2 times. But that rule would apply equally for shareholders and bondholders, so that pro-debt bias in the tax code would be eliminated. And the revenue generated by disallowing any deduction for interest would be used for pro-growth reforms such as a lower corporate tax rate. No tax on income generated by exports and no deduction for cost of imported inputs for companies – The House GOP proposal is designed to be “border adjustable,” which basically means the goal is to have no tax on exports while levying taxes on imports. I’ve never understood why politicians think it’s a good idea to have higher taxes on what Americans consume and lower taxes on what foreigners consume. Moreover, border adjustability normally is a feature of a “destination-based” value-added tax (which, thankfully, is not part of the GOP plan), so it’s not completely clear how the tax-on-imports portion would be achieved. If I understand correctly, there would be no deduction for the cost of foreign purchases by American firms. That’s borderline protectionist, if not over-the-line protectionist. And it’s unclear whether this approach would pass muster with the World Trade Organization. To conclude, the GOP plan isn’t perfect, but it’s very good considering the self-imposed boundaries of dynamic revenue neutrality and favorable outcomes for all income groups. And since those self-imposed constraints make the plan politically viable (unlike, say, the Trump plan, which is a huge tax cut but unrealistic in the absence of concomitant savings from the spending side of the budget), it’s actually possible to envision it becoming law. You have it wrong on “no taxes on exports”. It would only be corporate taxes refunded, not salary, payroll, and taxes on components that are a much larger percentage of the export price. I completely agree that producers benefit from import duties and untaxed exports to the detriment of consumers. However, with territorial taxation, all goods consumed should have roughly the same taxes applied. You would not want imports to have a lower tax burden than domestic products. I agree with your comments, however, the key to success of a UBI is that it is kept at the poverty line, not $20,000. Also, someone earning money under the table would be risking future UBI payments. Indeed, I did not quite ponder in depth the details of what Mr Devany first wrote –sorry about that. What I saw was yet another attempt to keep current expenditure levels but tax people in a way that was less obvious — and thus, presumably, less detrimental to incentives. The argument misses the forest for the trees. To use Mr Mitchell’s words it amounts to little more than rearranging the chairs on the deck of the Titanic. 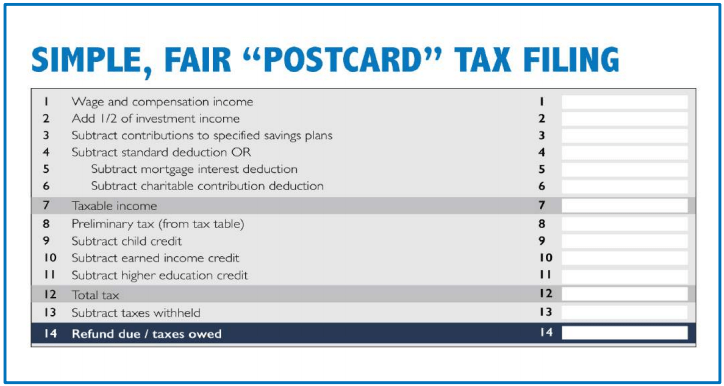 Back of the envelope calculation or not the end result is how much money will be confiscated in total to serve distant unknowns (people, bureaucrats, cronies) vs how much of a citizen’s vitality / income goes to serve himself and his family. That is what determines total aggregate motivation, that is what determines production efficiency and national competitiveness. If government consumes 37% of GDP then that is the average proportion of your vitality confiscated to the commons. The “how” is secondary — or even tertiary. Hoping to implement this tax in a way that people will not notice — and thus their motivation to produce is not reduced — is a fools errand. Sure, most people don’t know how they’re taxed (eg. Most people think corporate taxes are not paid by employees). However people do eventually become subject to the resulting effects of taxation and the effort-reward motivation curves they produce — whether the know, understand, or are even remotely aware of taxation. Sometimes there is wisdom even in simple country bumpkins. If you had put an American redneck farmer to debate against Karl Marx a couple of centuries ago, Karl Marx would have gone into lengthy socioeconomic monologues full of deep thought and unassailable sophistication. In the end, the exhausted redneck would have looked up with a blank stare and said: “I don’t know. I don’t understand — but I don’t think people will work for distant others”. These schemes to somehow collect more tax without people noticing remind me of those late high school / early college physics classes where students test in their minds the principle of conservation of energy by coming up with perpetual motion machines (indeed some clever) and you have to figure out why they don’t work. People may not notice how they are been taxed. But the laws of nature which dictate that everything which is consumed must first be produced — cannot be cheated. Whether rationally or empirically, everybody, even our unsophisticated redneck friend experiences the effort-reward curve that taxation creates. He might have no clue why, but he can empirically feel the steepness (or in this case the flatness) of the effort reward curve he is living under — a flatness created by taxation — whether explicit, overt, hidden or indirect. At best these taxation rearrangement gimmicks will have little affect. Just fool a few more people for a while or even fool most people a little longer (like the perilous delusion of printing money). But in the end there’s no free perpetual consumption — there’s no low effort membership in the club of the world’s most prosperous nations. Everything consumed must be produced. And only motivated nations can produce high enough added value to remain at the top of the world’s prosperity classification — as Americans have been accustomed to and taking for granted — to the point of thinking that their cultural and legislative convergence to Europe will have little impact on their prosperity. If you tax me with six different taxes at a cumulative 37% I will still experience what my resulting aggregate effort-reward curve is — even if I have no clue whatsoever about how exactly I’m been taxed. If you offer me $20k in unconditional guaranteed income (twice the average world salary) then I’ll quickly figure out that I can drop out of high school and if I can just manage to mow one hundred lawns per year then I can get by being a rather happy surfer for most of my life. You may tell me that I should study more, become more competent, have more ambition, and earn more because my marginal tax rate has not changed — but it won’t matter. The guaranteed modest happiness of a surfer’s life would still be preferable (in most cases) to the uncertainty and anxiety of ambition. I — and millions of my fellow citizens — will drop out into third world productivity — leaving a shrinking rest of you to pull an ever fuller cart. So the bottom line is: Will there be a taxation system whereby the government collects — and more importantly spends — a smaller proportion of GDP — which will also STAY small? A taxation method that does not give politicians –and voters– an easy handle to trap society in a high tax, low motivation, government dependency productivity deadlock? Or will we continue with current (and likely increasing) levels of GDP been diverted from personal use to distant others, bureaucracies, and wealth distribution by politics rather than productivity? Even at current levels of taxation the overall American aggregate motivation to produce has dropped to the point where a structural trendline growth of 2% — half the average world trendline ! — is considered the new norm we must accept. In terms of simple arithmetic we are basically been told to acquiesce and come to terms with decline. A full two percent growth deficit compared to world average will quickly compound us down into the middle income countries of this world — within a few decades. …now, with this parenthesis over, it’s back to the Karl Marxes … with percentages, graphs, detailed calculations, economic projections, social integrals — on how to trick people to produce for distant unknowns! … one of these days … … one of these days — that Holly Grail will be found. Paul Krugman has almost clenched it. Dorothy Olson was kind enough to take the intellectual plunge and actually think about valuation. This had been the Achilles Heel of soak-the-rich style wealth taxes before the internet and Kelley Blue Book. At the onset it is important to note that income is cumulative over the taxing period but net wealth is averaged so the tax filing period makes no difference. The wealth tax schedule would likely be no more than a page with most personal assets combined and valued as they might be in any estate sale and as an insurance company values these items. One should not tell the IRS the paintings are worth $5,000 and expect a casualty insurance company to pay $500,000 for a loss. Any items traded over the internet can now be valued with ease. When in doubt, send a photo and description to the IRS and let it provide a “no contest” valuation at minimal cost. Debts used to offset wealth would generally be limited to a declared asset of another taxpayer. Jay expresses concern for property taxes that could reach $1,800 per month on a $1.5 million home. [The sum is about what some of my neighbors pay in nearby Garden City, NY]. In any event, a 2% wealth tax attaches only to net wealth so it is better viewed as a 2% credit for the balance of the mortgage – (and much more advantageous than an income tax deduction for interest paid on the mortgage). The 2-4-8 Tax Blend is designed to help couples get their first $1 million and pay a bit more in taxes when they do. Those with $5 million or more in wealth will likely elect to pay no wealth taxes and a 28% income tax rate. The 2-4-8 Tax Blend promotes equality and economic mobility. Zorba does a back of the envelope analysis of the 2-4-8 Tax Blend and concludes that the top 2% will get richer while workers won’t get a break. In fact, the $500,000 wealth tax exemption for retirement, education and/or health care will help families slowly save their first million dollars because they can keep 92% of their income. I suspect Zorba did not consider that payroll taxes are eliminated under the 2-4-8 Tax Plan and this has a very positive impact on domestic employment. In fact the only income tax deduction allowed is the charitable deduction which is modified so it can only be used with charities that agree to provide transitional jobs during economic downturns. That could keep 2,000,000 off unemployment and reduce welfare transfers. Mr. Gieson, III understandably asks for an explanation “of just why if my income is taxed and my spending is taxed, that isn’t double taxation”. In one sense there is double taxation whenever there are two taxes of any type and most of us pay at least ten different taxes. All business taxes are a tax on spending since all business taxes are passed to the consumer. Nevertheless a sales tax attaches to the purchaser (at the rate of the purchaser’s residence) while a VAT is simply an income tax on gross sales with the seller given a credit for VAT taxes paid by other businesses in the chain of production. The VAT rate is fixed by the location of the business and different governments can piggyback. In any event consider that those with good credit can get a Citi card that pays 1% when a purchase is made and another 1% when the balance is paid. Few would consider this double the refund. It is a 2% refund that is credited half at one time and the other half at another time. When the government uses all three tax bases, the rates on each base can be one third what they would be if only one tax base were being used. Lower rates are not double taxation. The median home price in that enclave of environmental responsibility called San Francisco is around 1.5 million. Do the simple arithmetic and that amounts to a real estate tax burden of around $1,800 per month. No you read right –per month– not per year. And that is for real estate taxes alone. How are you supposed to find enough money to buy a Tesla? The government ain’t helping out enough — the subsidy is too low. Gimme more. Taxing wealth is NOT “double taxation”. It is 30 or 40 or 70 times taxation, because you pay it every year of your life. I pay property taxes that come to about 2% of the market value of my house. So in 35 years, I’ll pay the government as much in taxes on my house as I paid the builder! If I bought a house when I was 20 and lived there until I was 70, 50 years, I’d pay about 40% MORE to the government than I paid to buy the place! And that’s after having to pay taxes on the income I used to buy it. Now to get rid of the Departments of Education, Agriculture, Housing and Urban Development and Homeland Security for starters and we may be onto something. Few people understand that the job they currently hold was most likely created with dollars that somehow escaped taxation. It’s even worse than that, because he also wants to tax it just for the holding of it between the earning of it and the spending of it, depending on when one’s “wealth” is measured. Is it the greatest value held during the tax year, or the amount on the first or last day of the tax year? How does one value non-cash assets: an annual appraisal? And don’t forget that a tax on non-cash assets would have to be paid from cash accounts. Does everyone with some wealth to his name have enough liquidity to manage that? Earning and spending is fairly easy to track and calculate; valuation of wealth presents some problems. …besides being triple-taxation. The central goal of the Devany plan to get every individual to work a majority of his/her day for the community of distant others rather than himself and his family — and do so with enough enthusiasm to outcompete the remaining seven billion of this planet! — to propel the US into a growth trendline equal to world average (4%) — so that Mr Devany can stay in the world’s top 2% as a member of the American middle class. — See, so easy! It’s a shame other countries have not figured out this easier, gentler path to prosperity. A good plan it may be. But will “The People” accept it? Will they go along with the spending cuts that — as arithmetic implies — must inevitably accompany such revenue reform? Governments, by en large, do what people want. People want subsidies so government hands out subsidies. People want redistribution so government engages in redistribution. People want regulation so government engages in regulation. People don’t want to pay taxes so taxes are primarily levied on a minority (at least that is what people think). It is actually seldom that government actions and the aspirations of “The People” diverge — and this is why it is such big news when it happens. Eg. the British government thought that 52% of the people were on its side, but it turned out to be only 48%. It’s so uncommon that the world was caught by surprise. Mr Devany, please explain just why if my income is taxed and my spending is taxed, that isn’t double taxation? For the lowest rates [principle 1] we need to tax all three tax bases (wealth, income and consumption). Double taxation [principle 2] is not violated by taxing what is earned (income) and what is spent (consumption) and even what is accumulated (wealth). Double taxation is a problem when just one tax base is overtaxed like payroll taxes on top of income taxes on wages. A 35% individual dividend income tax with a 35% corporate income tax is a problem; but an 8% individual income tax with an 8% corporate rate is no problem. The key issue in fair taxation is that some will always be able to avoid taxes by shifting their business model from the tax base that is taxed to another that is not taxed (like wealth accumulation without capital gains income, consumption or investment in durable goods and assets rather than non-durable goods and services). The issue of tax expenditures [principle 3] always distorts the tax code when just one or two tax bases are taxed. The 2-4-8 Tax Blend is based on a 4% VAT, 8% C corporate income tax rate and no payroll taxes. With low rates tax expenditures are not needed. The individual tax code recognizes the need to tax both wealth and income – inversely. Imagine an individual tax calculated on both wealth and income that begins with a choose-your-own income tax rate between 8% and 28%. Each rate would be pared with a decreasing net wealth tax rate ranging from 2% down to zero at the top 28% income rate. To encourage middle class success, each taxpayer would be able to save up to $500,000 (for retirement, education or health care) exempt of wealth taxes. The inverse taxation of wealth and income, combined with a wealth tax exemption, creates a fair and balanced equation that encourages middle class success while giving flexibility to the richest 5% that control most investments and jobs. While billionaires might be content to pay a flat 28% income tax rate to avoid any wealth tax, the system should be enhanced to provide that cumulative wealth taxes paid would reduce flat rate estate and gift taxes of 28%. This would encourage even the ultra-wealthy to voluntarily pay some wealth taxes like an inexpensive form of life insurance – particularly in years of very high earnings or capital gains. It would also give those with excess wealth near the end of their life the option of disbursing assets before death with no tax disadvantage.